Arizona is a financial services hub with a growing number of positions, especially entry-level financial service professionals, financial advisors in training, analysts, and investment professionals. As the number of jobs continues to grow, companies need alternative paths to develop the talent needed to expand their operations. Several Phoenix-based financial institutions have joined together to form the Financial Services Collaborative. The Collaborative developed programming to incentivize potential employees to pursue training for licensing in the financial services sector. Following two successful pilot programs for the Series 7 exam, the Collaborative launched the Financial Industry Training, a month-long program to prepare individuals to pass the initial licensing exam, the Securities Industry Essentials Exam (SIE). Once a candidate completes the training and passes the SIE Exam, they are eligible for hire by one of the participating employers, who will then sponsor the candidate to take subsequent licensing exams. Is your company looking for qualified talent? 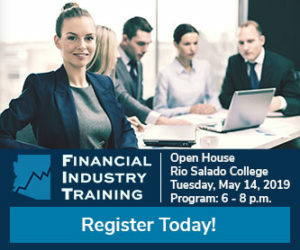 Are you interested in a Financial Services career?